When it comes to storage space few of us could do with less. 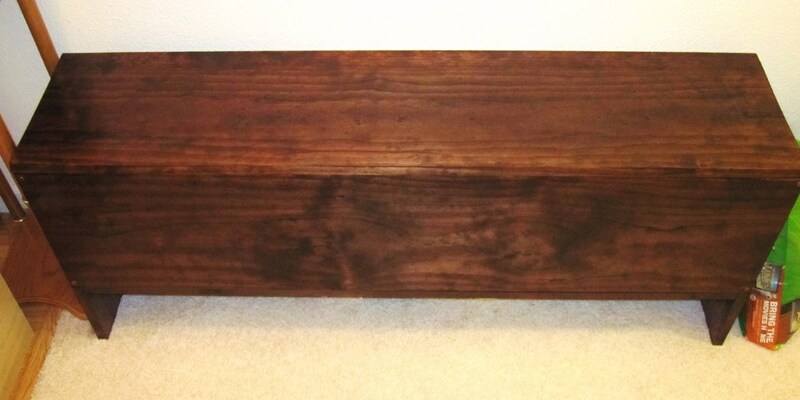 Any time a piece of furniture can do its intended job with a bonus of being a storage bin, well that is great in my book.This bench is great for hallways, pianos and the end of beds. 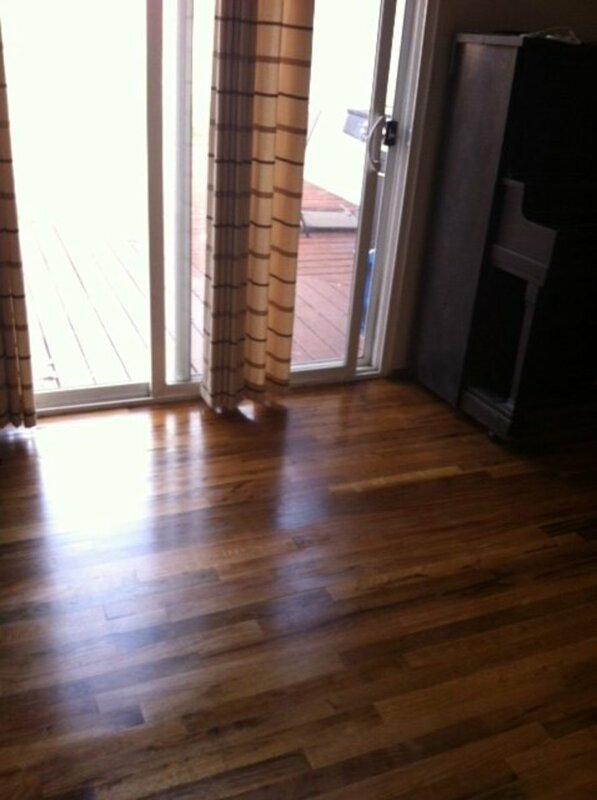 It has a great finish that shows the natural beauty of real wood furniture and is easy to clean. On top of all that it was my very first carpentry project, and if I can do it then I believe anyone can. Finished bench holding 2 king size comforters and a king size summer quilt. My house has an extra wide hallway and we needed somewhere to sit to put our shoes on. In no hurry we took our time thinking about what we might like to see there. During a trip to a large hardware store I saw some wood boards on sale and had a eureka moment. I stopped and stared, building the boards into a classic wood bench in my head, much like you'd see for a piano. Very happy with what I imagined I told my husband we need to buy five of these. He looked at me funny and gave a hesitant OK. He's come to expect weird do-it-yourself projects and crafts from me. Later I explained my project to him. He was pleased but skeptical it would ever come to fruition. I gathered all my supplies but my project had to wait until cold rainy season passed. Winter came along and I became pregnant with our first child. Wood stain has some pretty nasty chemicals that pregnant ladies shouldn't be around so my project got put on the back burner. A beautiful boy was born in August. My project was back on schedule for the next summer. The next summer came around but we had decided to try for another baby. Too paranoid that the month I decide to do the project would be the month it finally happened I put the project off for yet another year. I became Pregnant the following year around April. The boards were collecting huge amounts of dust under our couches. My Little girl was born in December this last year. As summer approached I told by husband I was determined to make our bench. For a moment he seemed to have forgotten. Four years late I finally finished this bench... and it blew away all my husbands expectations. Which is more than I can ask for coming from my very first carpentry project. 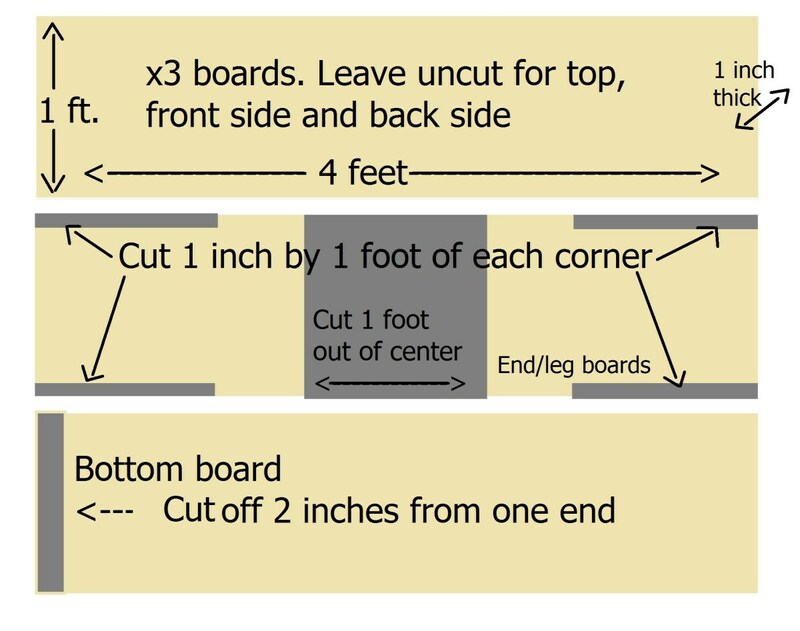 Measure and mark your boards at least twice before cutting. 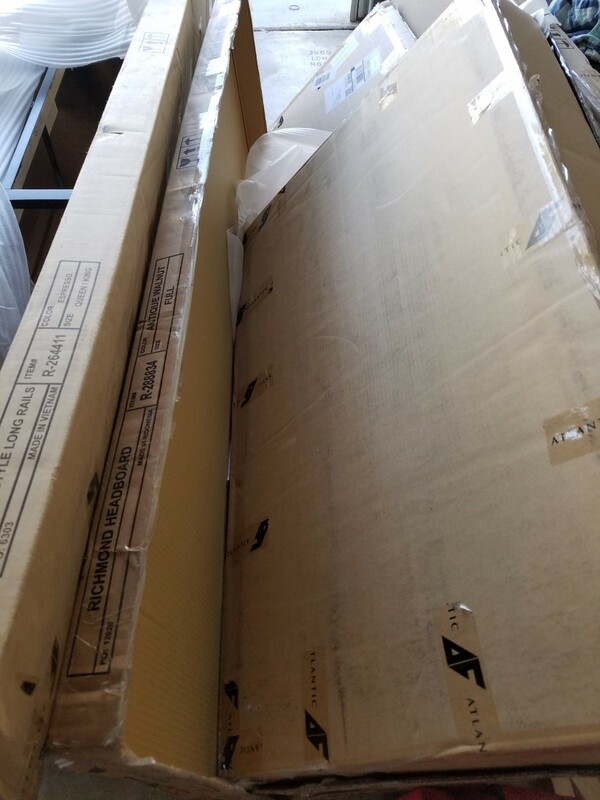 While sawing your boards make sure they are stable. I had my husband help hold them for me. Its better to have to go back and trim off wood than to have taken too much and having gaps. If you try to cut exactly on your pencil mark you may take too much so always aim a little over into to wood than wont be used. The front and back of the bench will have 4 screws each, 2 on each end. Fit the front side into the notch you cut out of one of the legs. Hold it stable and drill holes where you want your screws to go in. Once done you can easily screw in your screws. Repeat this will all corners. Place the bench top side down so that the legs are in the air. Take the board labeled bottom (the one you sawed 2 inches off of) and fit it between the legs. If it wont go in you'll have to use the coarse sandpaper and rub down any unevenness until it fits. 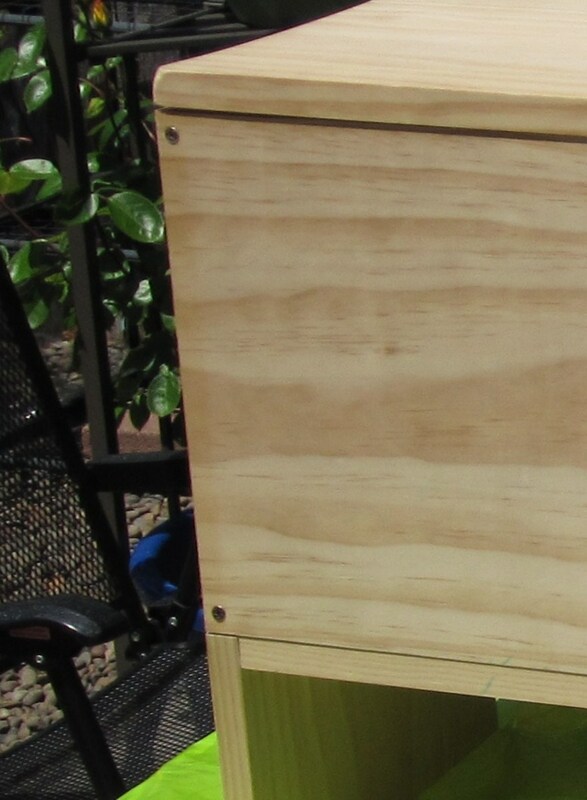 Drill Holes into all four corners of the bottom board and in the middle of the long edges. Screws can then go into each of the 6 holes. This was a little awkward. It works much easier if you have someone to help hold the top board. However it can be done on your own. 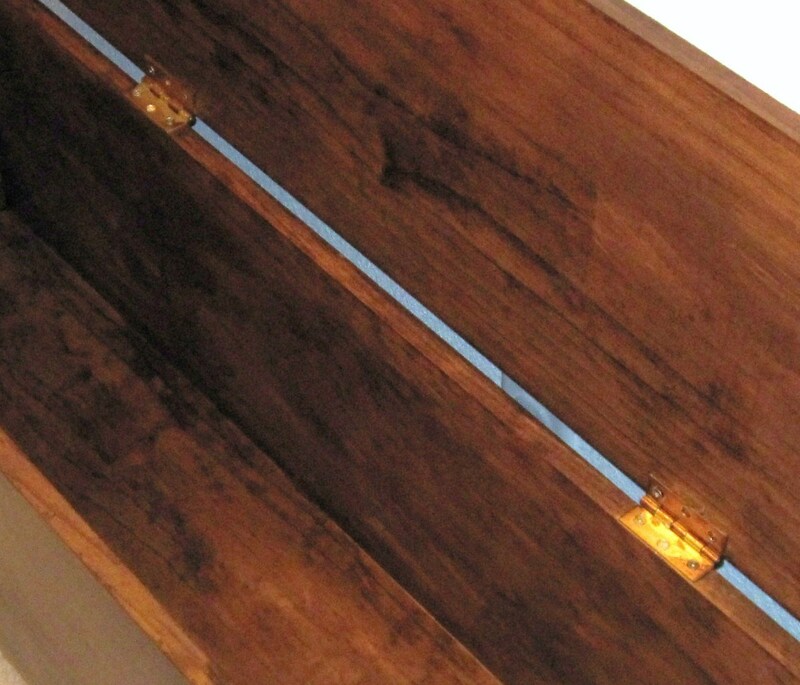 Start by attaching the hinge to the underside of the top board. Very small drilled holes may be needed. Stand over your bench and with one hand hold the top board in the open position as shown in the picture and with your other hand screw in the other side of the hinge. Take your bench outside. You don't want to breath this stuff in too much. For this step you'll need the wood finish/stain, gloves that keep out liquid (latex, plastic food gloves or dish gloves all work) and the rags. 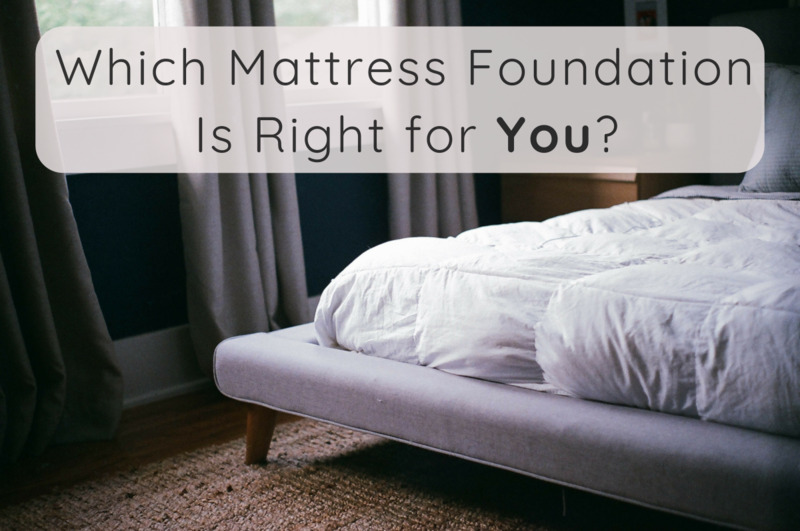 Make sure your stain is well stirred. Dip one of your rags just a little into the stain. You don't want it dripping everywhere but enough to spread on the wood. Rub the stain rag onto the bench going with the grain. 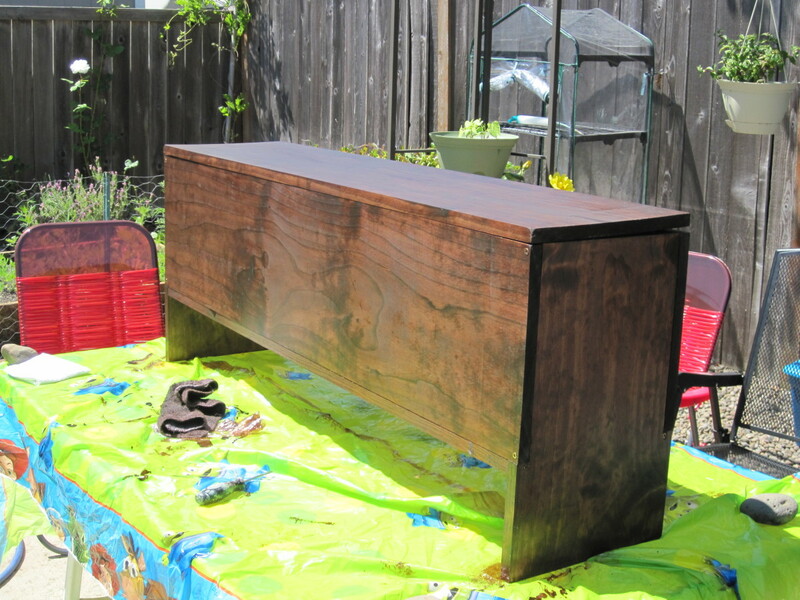 Continue applying stain until the bench is evenly coated. When you finish take your clean rag and going back to where you started rub off any excess stain. Let your now beautifully stained bench sit for 24 hours. Time to add your final finish. Take the paintbrush and apply the polyurethane, brushing with the grain. You are going for an even thin coat. Let sit and dry for 4 hours. 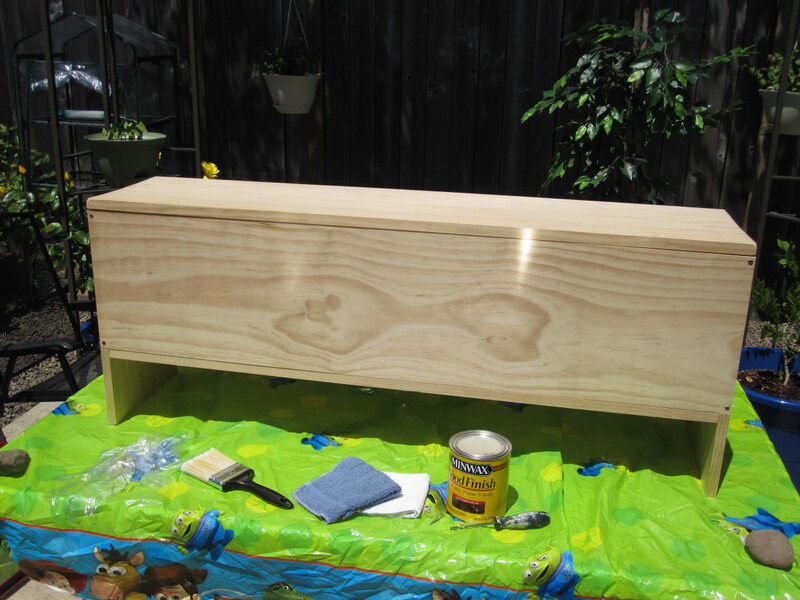 Come back and use the fine or extra fine sandpaper and lightly sand the whole bench. Brush off any dust and apply a second coat of the polyurethane. After it dries at least 8 hours ( I waited 2 days) you can bring it inside and use it lightly. It will be completely usable in about a week. Your bench can be topped with pillows or left plain. 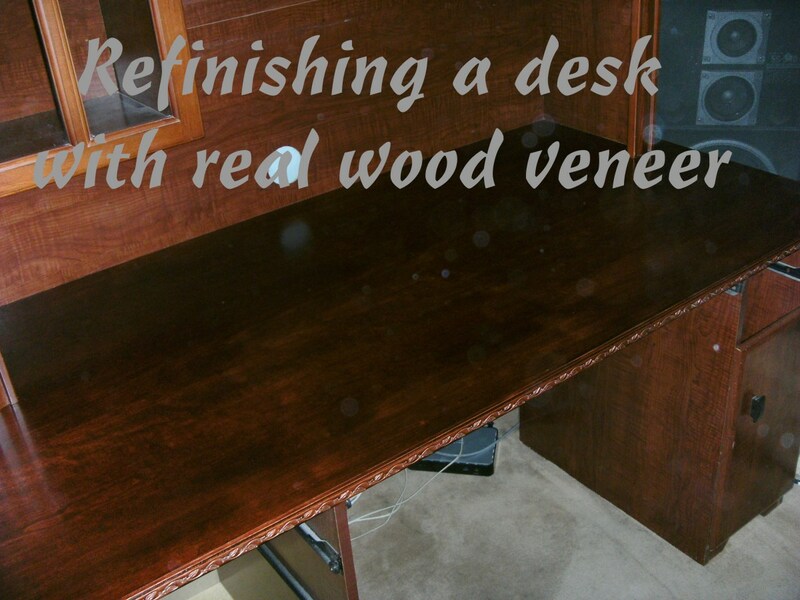 To keep it looking beautiful for many years use wood cleaners for any messes. Cyoung, I hope this project goes well for you ^_^ We just love ours. Thank you so much for your wonderful comment! I have a hard time cutting a straight line but I think I could do this one. I'm going to try one and if it works, I'll build abother for the other side of the room. What a great hub! WOW fabulously creative, I'm very impressed. I'm very D.I.Y. but always seem to over engineer everything. When I'm stuck I call on my farmer neighbour who takes a quick look, says try this and then leaves. He's great as he always leaves me saying "now why didn't I think of that". I should maybe stick to cars and bikes. Thank you idigwebsites. Everyone could use a little more storage ^_^ I'm so happy you found this helpful. Thank you for your great comment! Great hub, Mama kin. Now I'll hav e another good way to create storage for my stuffs that needs immediate "home". thanks again! Deepak, I'm so happy you liked it ^_^ thanks for commenting. Mama kim thanks to share this useful hub with us. After reading your child memories hub just a moment ago and then coming to this hub it made me realize that my love of building things out of wood came from my dad. 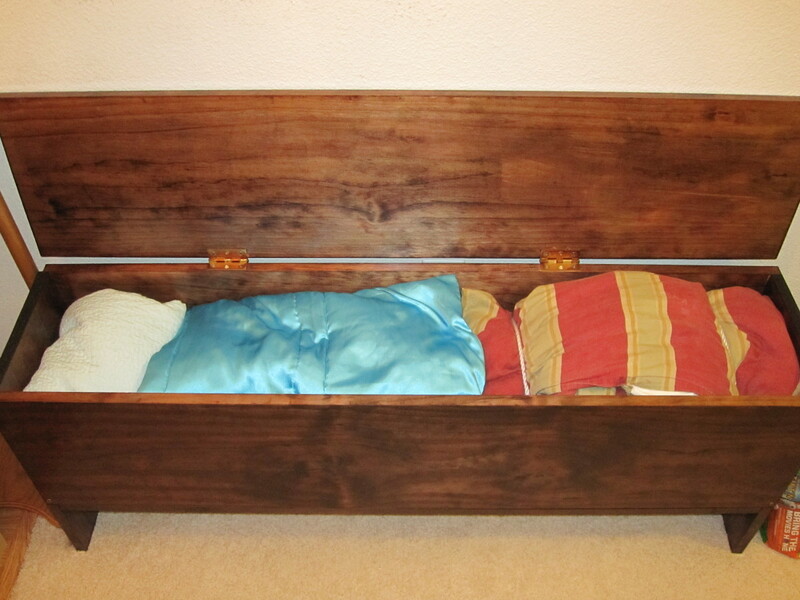 He didn't leave me with many good memories, but his carpentry and artistic skills always left me in awe as a child. As always its so nice to see you my friend ^_^ thank you. I agree with Rajan there, Kim, amazing, amazing work. And it took lots of resilience and determination, a strong feeling I get as I read your hubs. I am sure though, that you felt a real sense of satisfaction after the bench was completed......it always feels that way when we finish doing stuff, doesn't it? This write was wonderful, and I"m sharing. This is amazing work Mama Kim. The bench looks awesome. My hands are itching to get to work. Thank you TToombso8, We adore our bench so I'm sure you'll adore yours ^_^ I'm totally with you on the cushion! My original vision had a cushion I just have yet to find or make one. Oh thank you so much Patty! I wish you the very best as well. Very Useful Information!!!! I love benches and anything that can be used for storage and look good at the same time!!! Awesome Job and I wish the very best for you and your family! !